We’re able to bring you the new 2017 Audi Q5. The very good medium-size SUV is now available to those on the lookout for a luxurious and talented new Q5. More and more people are choosing the SUV way to drive, and it’s this popularity that is motivating most car manufacturers to focus on producing plenty of SUVs in their model range. One might think that the higher ride height of an SUV might feel more alienated from the driving experience, but it’s SUVs like the new Q5 that show how involving vehicles like this can be. 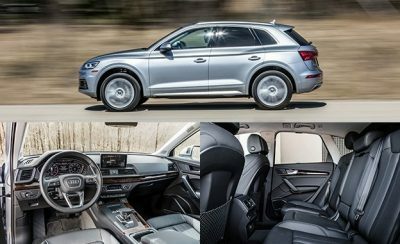 Audi’s new Q5 hunkers down well in the corners, grips well on any road surface, and the higher ride allows you to see more of what’s happening outside the car. Audi’s Q5 boasts acute steering manners that can be linked to a chassis that has been thoroughly engineered to ride effortlessly over any road surface. The ride quality is excellent and comfortable – just the way a passenger likes it. Audi has incorporated the use of more lightweight materials in the 2017 Q5’s make-up which has seen a 90 kg reduction in overall weight. Compared to the previous Q5 model the new Q5 is 34 mm longer, with a wheelbase that has been extended by 12 mm. Cabin space feels slightly roomier, and there has been a 10-litre increase in cargo space. The new Q5 also features a convenience rear seat “Bench Plus” arrangement that allows the 40-20-40 split rear seat to slide forward-and-backward to vary load space between 550 and 610 litres. This is ingenious and extremely practical. One of the really new bits of Audi technology you’re going to enjoy with the 2017 model is the all new ‘Quattro Ultra’ driveline. This new technology allows for the driver to disengage the rear axle from the AWD Quattro capability via the Driver Select menu. In FWD mode, AWD will engage if any loss of traction is detected. This feature is purely for fuel-saving purposes, and Audi think that this new Quattro system can reclaim up to 60 percent of the fuel consumption that full-time AWD takes. Test out the off-road potential of the latest Audi Q5, and you’ll be impressed with the way the Quattro Ultra system easily progresses over tricky terrain. Sure-footed Q5 traction is affirmed with a suspension that comfortably soaks up uneven surfaces on-and-off road. 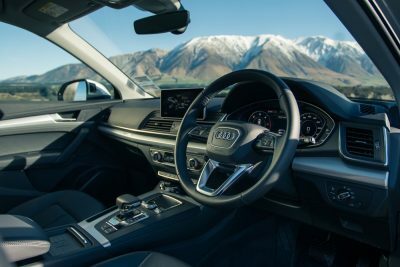 If you find yourself having to negotiate your way across slippery paddocks, icy roads, rocky farm tracks, shallow fords, and sandy tracks the Quattro Ultra system offers commanding control with fast-reacting electronics. A sonorous engine note is a nice reflection of the tidy performance you’ll enjoy from both 2.0-litre power plants. A 2.0-litre TDI with 140 kW of power and 400 Nm of torque is both strong and efficient. The full 400 Nm is available between 1750 and 3000 rpm. Opt for the 2.0 TFSI petrol engine, and power climbs to 185 kW – while torque peaks at 370 Nm. In this review we concentrate on these 2.0-litre offerings, but for those who want thoroughly arresting performance, then the new Audi SQ5 with 260 kW and 500 Nm will impress. It really doesn’t matter which new Q5 you drive. The majestic quality and comfort of the Audi designed interior is always present in any new Audi car. The 2017 Audi Q5 2.0 TDI quattro S tronic Design models boast a seven-speed S-tronic dual clutch transmission, 19-inch alloy wheels, LED headlights, LED tail lamps, three-zone air-conditioning, a powered tailgate, MMI Navigation Plus, Comfort Key cabin access, heated seats and memory powered front seats. A classy new Audi Virtual Cockpit dash display catches your eye, and this new Q5 boasts the Audi Phone Box with wireless charging for your smartphone and Audi Smartphone Interface as standard. Five-star safety equipment includes traffic sign recognition, adaptive cruise control with stop-and-go function, active lane assist, collision avoidance assist, pre-sense systems, turn assist and cross traffic assist features. This is all fantastic equipment that is standard on any new Q5 model. Both the Audi Q5 2.0 TDI quattro S tronic Sport and Audi Q5 2.0 TFSI quattro S tronic Sport boast loads of features to keep your SUV Q5 drive sporty and at the forefront of its class. You’re going to look awesome with 20-inch alloys, sports seats, Milano leather trim and a Parking Package with a 360-degree camera. City car parks are a breeze with this cool parking package. . 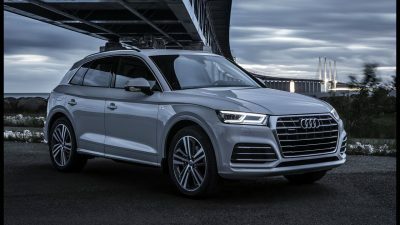 There are still some options to be had for the new Audi Q5 which include an adaptive air suspension, Head-Up display, 21-inch alloys, a sunroof, and a ‘Bang and Olufsen’ audio upgrade for music buffs. Always a premium and satisfying buy, the new Audi Q5 looks smoother and sleeker than ever. Adding smarter modern technology keeps the latest Q5 in the leading bunch. For any more information on the latest Audi Q5 models or, for that matter, any other new car, contact one of our friendly consultants on 1300 303 181. If you’d like some fleet discount pricing (yes even for private buyers! ), we can submit vehicle quote requests out to our national network of Audi dealers and come back with pricing within 24 hours. Private Fleet – car buying made easy!